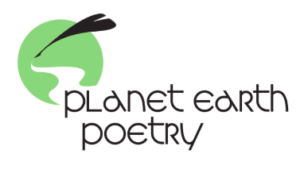 February 15 – 7:30pm, Planet Earth Poetry, Hillside Coffee and Tea, 103- 1633 Hillside Avenue, near the Hillside/Shelbourne intersection. I will do a featured reading, as will Alice Major. Saturday, February 16, 2 to 4:30pm, Nanaimo North Library, 6250 Hammond Bay Road, Nanaimo, BC V9T 6M9, Canada. Interviewing is tool writers of all genres will find valuable for inspiration, research, and documentation. In this participatory workshop on interviewing, you’ll learn techniques to quickly develop rapport, ask questions that spark thought provoking responses, and sharpen your skills in this under-appreciated art form… Presented by Wordstorm. Sunday, February 17, 2019, 2-4pm – The Abbey, 2687 Penrith Ave (enter on 1st St.) Cumberland. 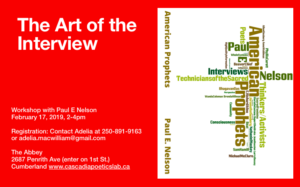 The Art of the Interview: Paul E Nelson discusses American Prophets: Interviews 1994 to 2012, featuring poets Allen Ginsberg, Anne Waldman, Wanda Coleman, Jerome Rothenberg, Nate Mackey, Brenda Hillman and Sam Hamill, and will facilitate an interview exercise. Participants will learn techniques to connect with a guest, quickly develop a rapport and sharpen skills in this under-appreciated art form. 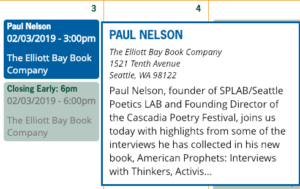 Paul E Nelson has conducted over 600 interviews with poets, authors, indigenous leaders and whole systems activists through his non-profit organization SPLAB and will discuss how he prepares for interviews, the difficulties that are sometimes encountered, tech aspects and how to develop your interviewing technique. Copies of the book American Prophets will be available for purchase. A featured reading at the Red Tree happens in the evening at The Abbey. 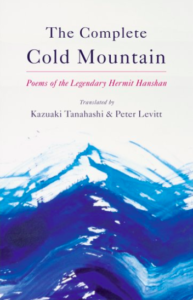 I will also travel to Salt Spring, to interview Peter Levitt on his new book with Kaz Tanahashi, The Complete Cold Mountain. 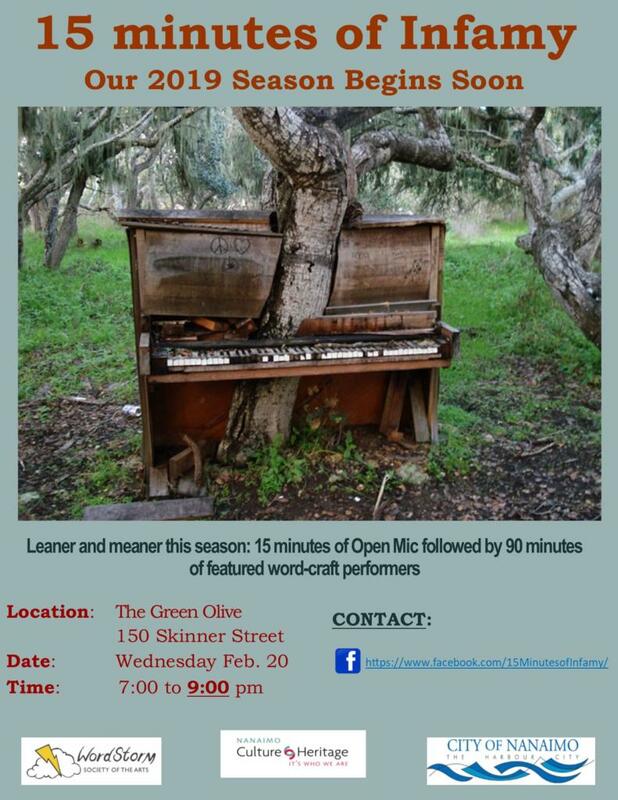 My last gig will be Wordstorm’s FIFTEEN MINUTES OF INFAMY, Wednesday, February 20 at 7pm at The Green Olive Room on Skinner Street. There are 3 Open Mic spots and 5 featured performer slots, one of which I will do. TheHost is Nanaimo songwriter, Donna Konsorado Other features: Victoria storyteller, Peter Freeman and Qualicum Beach poet, John Beaton. This class is $45 per person and preregistration is required. You can reserve your spot at our online store here.